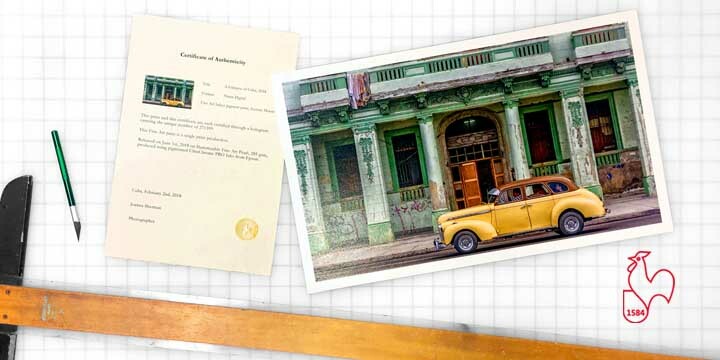 A Hahnemühle Certificate of Authenticity provides fine artists and photographers an easy way to protect their art. The easily verifiable holographic matching system ties one print to one certificate. A set of two holographic badges are used; one on the back of the reproduction, one on the front of the Certificate of Authenticity. The Certificate of Authenticity is printed exclusivly on watermarked, deckle edged Hahnemühle certificate paper. Select a Hahnemühle paper for your certified print or print series. Mounting and finishing must be done at the time of certification. If no mount option is chosen, the certificate's holographic badge will be adhered to the back of the print. Proof your certificate to ensure that all of the information is correct. Download our full catalog here to see more details on Hahnemühle fine art printing and finishing options.